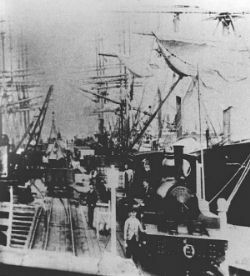 Prior to the construction of Fremantle Harbour Albany,some three hundred miles and a five day coach journey to the south, was the main deepwater port for the colony of Western Australia. The lack of adequate port facilities with good transport links to the growing agricultural districts was hampering development in the colony. The building of the Eastern Railway and other public works were stretching the colony financially. 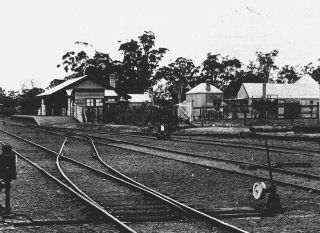 Proposals were therefore put forward in 1880 to build a railway under the land grant principle to connect the port of Albany to the rest of the colony. In September, 1881, the Colonial Secretary requested the Legislative Council to vote £600 for the purpose of securing information concerning the country through which the railway would pass. "that in consideration of European Capitalists constructing railway of similar class to the New Zealand lines 3 ft. 6 in. and undertaking settlement of not less than say 5,000 people in the colony, the Crown should grant in fee two million acres of land to be selected by them between Beverley and King George's Sound." Numerous offers to construct the line came forward. A Tasmanian Syndicate offered to build the line provided the Government would guarantee 3.5% interest on £1,000,000 for 25 years. The net profit above 7% on capital would be divided between the Government and the Syndicate. The Government was to-have option of purchase at any time on giving one years notice. Much as the Government wanted the line the offer was considered to be too one-sided. Colonel McMurdo offered to construct the line to Albany then on to the South Australian Border in return for 10,000 acres per mile. Mortgage bonds were to be issued to the value of £4,000 per mile upon which the Government should guarantee 3% interest for 30 years. In lieu of stamp duty and taxes, the Government was to receive 10 per cent net earnings yearly. The Company was also to bring in 40 selected immigrants per mile of line. This plan however lapsed. The offer of Sir Anthony Horden a wealthy New South Wales business man of great vision and one who had untold faith in the possibilities of Western Australia and of the Albany area in particular was finally accepted. Mr Hordern formed the Western Australian Land Company in London with a capital of £300,000 and a debenture issue of £500,000 to build the line from Albany to the then Government Railway Terminus situated at Beverly. Unfortunately he died aboard the mail steamer "Carthage" on his way back from England in 1886. Thus he did not live to see the benefits gained from his mighty efforts. His name has been perpetuated in Albany by the erection of a red granite column in a conspicuous place at the intersection of four main arteries in the town. He had in mind many great schemes including the erection of a large College of Agriculture and an extensive experimental farm, such was his faith in the future of the area. Mr. Hordern's contract was transferred to the Western Australia Land Company by the Legislative Council in 1888. The terms of the concession were that the Company was to receive a subsidy of 12,000 acres of land per mile, to be selected east and west of the line within a belt 40 miles wide on each side. A further proviso limited the concession to only one half of the frontage for 20 miles of continuous length. The Company was also required to bring in 5,000 English Immigrants and on they landing of each one the Company was to receive £10 per head. The line was to be from Beverley to Albany a distance-of 243 miles. Millar Brothers of Melbourne secured the contract to build the line at a cost of £1,550 per mile. The first sods were turned at Beverley and Albany simultaneously on 20/10/1886 by Lady Broome and the Governor Sir Frederick Broome respectively. The line was constructed to 3' 6" gauge using 46lb rails with a ruling grade of 1 in 50. The line was constructed through generally undulating country. Therefore there were now major civil engineering works on the line. From Albany the line rose to 1315 feet north of Narrogin before falling to 649 feet at the northern terminus at Beverly some 241 miles from Albany. Work proceeded at a good pace although the loss of two vessels carrying materials slowed things up to a certain extent. 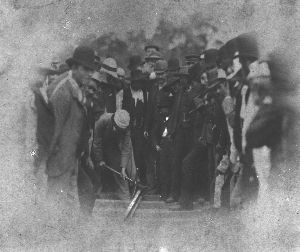 The final spike was driven on 14th of February 1889 at a point 122 miles from Albany by Mr T.W. Powell, Chairman of the WA Land Company.It is recorded that the first trial passenger run took place from Albany to Mt. Barker on 13th April, 1889. A number of passengers were invited to make the return trip free of charge. The official opening of the G.S.R. took place on 1st June, 1889. A special train left Albany on 31st May arriving at Beverley next morning. A train conveying Governor Broome and party arrived from Perth about the same time and both trains coupled together travelled to York where a lavish banquet had been arranged. Shortly after the line was opened an attempt was made to derail the mail train between York and Beverley on which Lady- Broome was travelling. A woman was later arrested in connection with the incident. However she was considered to be of unsound mind. The initial service consisted of a mixed train each way every weekday and a through mail train connecting with the mail steamers each day weekly as required. The mail train was timed to cover the 241 miles from albany to Beverly in just over 11 hours. Passengers would break their journey at Beverley before continuing on to Perth the next day. The company initially purchased six 4-4-0 tender locomotives from Beyer Peacock & Co for working train services. There were also a small 0-6-0 tank locomotive named 'Princess', purchased from Kitsons & Co, for shunting purposes on the Albany Wharf. 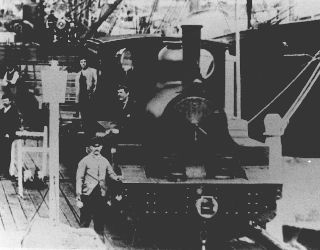 The tender locomotives entered service between 1888 and mid 1889. A further four locomotives to the same design were built by Kitsons between 1889 and 1890. The tender locomotives all carried names of GSR company directors or places along the railway. A second 0-6-0 tank locomotive to the same design as 'Princess' was purchased in 1892 and named 'Duchess'. Passenger accomadation was provided by ten bogie composite brake coaches. By contemporary Western Australian standards they were well appointed, being the second group of bogie coaches to be used in the colony. There were no lavatory facilities provided on the coaches, which was normal Western Australian practice at the time. The Company met with mixed fortunes in operating the line.Although the service was welcomed by all, it was not a particularly profitable venture. Unfortunately-the immigrants brought out by the Company were mainly from manufacturing areas of Great Britain and they did not take well to clearing land and establishing holdings.Failure of the Company to sell or lease the land also made matters worse and at one stage land could be purchased for about 10s. per acre. Ultimately the public clamoured for the Government to take over the line and this event took place on 1/12/1896 at a cost of £1,100,000, i.e., £800,000 for railway and £300,000 for land. 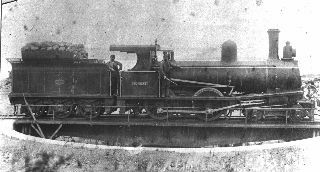 At the time of the Government takeover the ten 4-4-0 tender locomotives became the W.A.G.R.T class Nos. 164-173 and remained in use for many years number 170 being the last to go in 1952. The two 0-6-0 tank locomotives became the W.A.G.R S class continuing in service until withdrawal in 1915 and 1916. The passenger coaches were reclassified into the AD class. The lack of lavatory facilities meant they were eventually downgraded to suburban trains. An additional four coaches had been on order at the time of the takeover. These coaches became part of the AC class on the W.A.G.R. The only surviving piece of GSR rollingstock is a 6 wheel brakevan which is now in the Bassendean Rail Transport Museum.